Dear fig trees in God’s vineyard: Grace, mercy, and peace to you from God the Father and our Lord and Saviour Jesus Christ. Amen. What horrible sinners those victims of the La Loche shooting must have been that God would allow them to die in such an awful way. Or the victims of the mass shootings this week in the U.S – what sinners they must have been that they died so tragically. And surely the victims of tornadoes and flooding that we’ve heard about must have been worse sinners than other people since an act of God would kill them in such a way, right? No, says Jesus. That is not how we are to look at the disasters around us. We are not to look at the disasters around us and think about the sins of others. The fact that someone dies in a disaster is no indication of whether or not they were punished by God for their sins. Disasters around us are not a call to repentance for those who died. They are a call to repentance for us. Unless you repent, you will all likewise perish. Disasters around us are not a call to repentance for those who died. They are a call to repentance for us. Unless you repent, you will all likewise perish. Yes, of course. The whole world needs to repent and join us here in the church. If you’re still hearing it like that, you’re still hearing it wrong. This call to repentance is for the church. This call to repentance is for you. This call to repentance is for me. The barren fig tree of which Jesus speaks isn’t out in the wilderness somewhere. It is in the vineyard – the symbol of God’s chosen people. The fig tree which God threatens to cut down and throw out of the vineyard is in the Church. The New Testament equivalent would be that those who God overthrew in the wilderness had been saved from the slavery of sin through Baptism. They had heard the words of absolution spoken to them. They had eaten the same spiritual food and drank the same spiritual drink of Christ’s true body and blood. Nevertheless, God was displeased with them and killed them. Why? Why was God so displeased with His own people? Saint Paul writes that it was because they were idolaters; they were sexually immoral; they were grumblers complaining about Moses and Aaron, the spiritual leaders God had given them (Nu. 14). So here, in this case, we do know that the people were punished because of their sins. And we are told that these things took place as examples for us, that we might not desire evil as they did. These things are written for our instruction. They are written so that when we see disasters around us, we hear them as a call to repent. Unless we repent, we will all likewise perish. God says, “As I live, declares the Lord God, I have no pleasure in the death of the wicked, but that the wicked turn from his way and live; turn back, turn back from your evil ways, for why will you die?” (Ezek. 33:11) God is so serious about His preachers preaching repentance that He threatens them. God threatens His own preachers whom He has sent. He says, “If I say to the wicked, O wicked one, you shall surely die, and you do not speak to warn the wicked to turn from his way, that wicked person shall die in his iniquity, but his blood I will require at your hand.” (Ezek. 33:8) Pastors who do not tell people to turn away from their sins have blood on their hands and will have to answer to God for their faithlessness. Such faithless pastors are punished along with those they did not warn to repent. We still need to understand, however, that no amount of turning from sin will cause God to forgive our sins. We can mourn and lament over our sins day and night; we can sit in sackcloth and ashes for all of Lent; we can cry ourselves to sleep filled with regret over what we’ve done and failed to do. None of this moves God to forgive us. God is moved to forgive us because of the life and death of Jesus alone. That is the only thing that moves God’s heart to be forgiving towards us. God the Father is moved to forgive us because in His life, Jesus fulfilled everything that the Law demanded of us. God the Father is moved to forgive us because in His death, Jesus paid the penalty of all of our sins. Jesus is going to work on the sinner. He is going to dig with His Law. He is going to fertilize with His Gospel. He’s going to do it even more. He’s been doing it up until now, but He’s going to do it even more. He is going to remind you even more that you are baptized into Him. He is going to absolve you even more of all your sins. He is going to give you His body and blood for the forgiveness of all your sins even more. He’s going to give you more forgiveness because He doesn’t want you cut down and thrown out of the vineyard. There’s no question of whether or not we deserve to be cut down and thrown out of the Church. But Jesus pleads for more time for us. He’s going to work more through His Word in our hearts. He’s going to turn our hearts more. He’s going to keep heaping forgiveness onto us every time we fall into sin. He’s going to give us a desire to read His Word more which strengthens our faith. He’s going to give us a desire to receive His body and blood more for the forgiveness of our sins. He’s going to heap so much forgiveness onto us that we cannot help but bear fruit; we cannot help but keep turning away from sin; we cannot help but want to remain in His vineyard, the Church, where He digs and fertilizes so that we will live forever. At some point in time we will all face death, whether through a disaster or otherwise. That death or disaster will be harmless to us because of the work Jesus does in us in turning us away from sin and the work He has accomplished in forgiving us all of our sin. So even disaster is nothing for us to fear. Even shocking tragedies don’t remove us from the love of God in Christ Jesus. Even a disastrous death is not a judgment for those who are in Christ, but our death is always the door to heaven. So do not fear disaster; Jesus will work in you and you will live forever. Amen. We continue our Lenten series on the body of Christ, today hearing about the feet of Christ. If our country was at war, the good news of peace would be the only news for which we would eagerly wait. We wouldn’t care much to hear other news. What’s the latest political game of finger pointing on Parliament Hill? Who cares; when will bombs stop falling near my home? Who won the game last night? Who cares; when is my son coming home from the frontlines? What was our favourite celebrity wearing on the red carpet? Seriously? We shouldn’t even care about that now! When you are at war, the only thing you long to hear is that your warfare is ended. How much more eagerly we should desire to hear the good news of our warfare being ended with God Almighty, Creator of the heavens and the earth. Instead of living at peace with Him, we have rebelled against Him by every sin we have committed against the Laws of His kingdom. Every sin of thought, word, and deed is an act of rebellion and open warfare against Him. If we are not at peace with God, nothing else matters. Even news that might otherwise have some import in our lives must take a back burner if God is at war with us. How are my retirement savings doing in this market? Who cares if God is angry with me? What will the weather bring for my crops this year? Who cares if God is going to cast me into hell for my sins? How is the warfare going with Islamic militants? Who cares if God is at war with me? We long to hear the good news of peace, that our warfare with God is ended; that our iniquity is pardoned. God sent messengers of that peace throughout the Old Testament, and He still today sends His messengers to tell His people that their sins are forgiven. But Jesus Himself was the fulfilment of proclaiming this good news as He Himself said (Luke 4:18-21). Jesus is the fulfilment of proclaiming this good news, and He also fulfilled the good news. As Jesus fulfilled the good news with His hands, so He also fulfilled it with His feet. Jesus fulfilled the good news by walking all over the countryside proclaiming the good news as was prophesied of Him. He fulfilled it by walking on water and through His miracles which demonstrated that He is God. He fulfilled the good news by walking on the path that God has set for us to walk, but on which we have failed to walk. Jesus fulfilled the good news by His feet being nailed to the cross for us; by dying for the wandering of our feet from the path of God’s Word. This good news is foolishness to those who are perishing (I Cor. 1:18). To those who think that God doesn’t care about their sins or that their sins aren’t that big of a deal, the cross is foolishness. God Himself wouldn’t die for something He doesn’t care about. God Himself wouldn’t die for something that isn’t that big of a deal. Thus the cross is foolishness for those who are perishing. After all, they don’t think they’re at war with God. They think they are good enough on their own without Jesus. They think the good things they’ve done outweigh the bad. That’s why they’re perishing. That’s why they’re going to hell. All our good deeds are nothing more than filthy rags before God (Is. 64:6). For those who recognize their sins and turn away from them; for those who confess their sins and hate them; for those who realize that we need Jesus to bring us peace with God; for us the good news is the power of God unto salvation (Rom. 1:16). For us the cross of Christ is salvation and peace. We realize that Jesus’ cross is the good news of peace with God. We have peace with God through our Lord Jesus Christ because we are justified by faith (Rom. 5:1). It is not our own doing; it is a gift of God, not a result of works (Eph. 2:8-9). We have peace with God in spite of our works; in spite of what we have done and left undone. The peace we have is the free gift of God through Jesus Christ our Lord. Peace in Your heaven. (LSB 659 v. 4) Amen. Dear brood gathered under the wings of Christ: Grace, mercy, and peace to you from God the Father and our Lord and Saviour Jesus Christ. Amen. The fox threatens the hen and the hen outsmarts the fox, but this is not one of Aesop’s fables. Nor does this hen escape the fox’s teeth, but that is because this hen cares only to protect her brood. Jesus says that so often He would have gathered His people of Jerusalem like a hen gathers her brood under her wings, but they would not. Jesus sought to protect them – not just from Herod the fox – but from sin, death, and the devil. But they didn’t want to be gathered by Jesus. They didn’t want Jesus to save them. The people of Jerusalem looked at God’s Laws as if they were restraints that prevented them from doing what they wanted. They thought God’s Laws were like a fence keeping them from the grass that is greener on the other side. Who wants to be smothered by the wings of mother hen when you want to run free and be independent? Who wants to be under the wings of mother hen, especially when you see so many other chicks, seemingly joyful, running around doing whatever they want? Jerusalem had a reputation. It had a reputation for killing the prophets of God. God would send them prophets to warn them of the dangers of the roaming foxes. The prophets would warn them to stay away from sins that would entrap them; to stay away from the clever deceiver of the whole world who seeks night and day to devour them. But they weren’t going to be told what to do. They weren’t going to be told what is right and wrong. They wanted to follow their own desires. They wanted what the rest of the world had. They wanted the grass that looked so green on the other side of the fence. And they didn’t want to hear God’s Law preached to them. They didn’t want to hear God’s condemnation of their sin. What better way to shut the prophets up than to kill them? God sent prophet after prophet to them for years, but they hardened their hearts and would not turn from their sin. They killed prophet after prophet. Herod the fox had also joined the people of Jerusalem in killing the prophets of God. John the Baptist had preached to him telling him to repent of his adultery, but Herod didn’t want to be restrained from doing what he wanted. He didn’t want to be fenced in by God’s Law. He didn’t want to be gathered under the wings of Jesus. So the fox had the prophet John beheaded. This same fox then threatened Jesus. The Pharisees came up to Jesus and said, “Get away from here, for Herod wants to kill you.” But this hen is not scared off by the fox. Jesus responds, “Go and tell that fox, ‘Behold, I cast out demons and perform cures today and tomorrow, and the third day I finish my course. Nevertheless, I must go on my way today and tomorrow and the day following, for it cannot be that a prophet should perish away from Jerusalem.’” In other words, if that fox wants to kill me, I’ll be here, doing what I came to do. Jesus wasn’t afraid of Herod even though He full-well knew that Herod had killed His forerunner. Jesus also knew that Herod would be a participant in His trial and crucifixion. Jesus knew where He would die, and that was going to be the place with the reputation of killing those whom God sends – Jerusalem. But Jesus went to Jerusalem to die as a hen protecting her brood under her wings. The full punishment and wrath of God against sin was poured down onto Jesus and He protected His brood under the wings of His love and mercy. It’s not from Herod or any other earthly ruler that we need the most protection. We need protection from sin, death, and the devil. We need protection from the wrath of God because of our sin. This is why Jesus longs to gather us under His wings. He desires to cover us with His forgiveness. He sacrificed Himself for us and protects us from sin. He protects us from eternal death. He protects us from the devil, that sly fox who seeks to devour us night and day. Jesus still gathers us here in His Church, under His protective wings. He doesn’t gather us because we’ve been so good or because we haven’t wandered. He doesn’t gather us because we keep God’s Law. In fact, we’re just like the people of Jerusalem. We also often feel that God’s Laws are restraints that prevent us from doing what we want. We also often think that God’s Laws are like a fence that keeps us from the grass that is greener on the other side. Jesus gathers us to teach us that God’s Laws are not a fence to keep us from what is good, but a fence that keeps us away from what is bad and dangerous for us. God’s Laws are like a fence that keeps the fox out of the hen house where the brood can live in peace. But even more than that, Jesus gathers us to forgive us. We would never go to Him if He didn’t gather us to Himself. He gathers us and protects us from ourselves and our own desires to wander away from Him. His forgiveness covers us like a hen covers her brood with her wings so that we won’t be punished for our sins. When we stumble and fall, Jesus again picks us up. He again forgives our sin. He again gives us His holy body and blood for the forgiveness of our sins and the strengthening of our faith. He again gathers us to Himself so that we are not forsaken. Notice that in the message Jesus sent to Herod, He said that on the third day He will finish His course. Yes, Jesus knew that He would be killed in Jerusalem for our sins, but Jesus also knew that He would rise again. Jesus knew that death would not have the last word. He knew that the fox would not be victorious in the end. Jesus knew that He would give His life to protect His brood, but He also knew that He would rise again to continue protecting His brood; to continue gathering His brood under His wings. Jesus needs to continue gathering us because even though sin, death, and the devil were defeated by His death, these foxes remain out there to harm those who wander from Jesus. Sin continues to tempt, death continues to threaten, and the devil continues to deceive. So Jesus continues to gather us to Himself and continues to forgive us our sins because that is the only hope that we poor sinners have against our enemies. The hen was killed by the fox, but it was for the sake of the brood. Jesus now lives forevermore, and gives eternal life to His brood also. Amen. This Lent for our midweek services, our theme will be the Body of Christ. Our focus will not be on the body of Christ which is the Church, nor on the body of Christ which we receive in the Lord’s Supper. These are both the body of Christ, but our focus this Lent will be on Jesus’ hands, His feet, His head, His face, and His heart. Today, we start with hearing about the hands of Jesus. Throughout His earthly ministry, Jesus served His creation with His hands. His touch alone was enough to heal. He cared for the crowds who followed Him, feeding them, healing them with His hands. In a synagogue, He healed the withered hand of a man on the Sabbath (Matt. 12:9-14). He laid His hands on children that were brought to Him and blessed them (Mk 10:13-16). His hands were never idle; He continually used them to serve His creation. But this service to His creation did not begin during His earthly ministry. The Son of God has served His creation – since creation. The eternal Son, through whom the world was created also holds all things together (Col. 1:16-17). Our Old Testament reading spoke of how God took His people by the hand to bring them out of the land of Egypt. What a loving depiction – leading His people out of slavery by the hand. Gentle yet firm. Holding to prevent falling or a desire to return back into slavery. Pulling along so that escape from slavery is possible; pulling forward stronger than slavery pulls back in order to redeem His people. The Old Testament continually speaks of God saving with His outstretched arm. God rescued Noah and His family through the flood. He saved Abraham from His idolatrous culture and brought him into the promised land. His hand kept Moses safe in the basket so that he would not be murdered by Pharaoh’s soldiers. God’s hand parted the Red Sea to rescue His people from slavery in Egypt. His hand knocked down the walls of Jericho, giving victory to His people. His hand rescued Daniel from the lion’s den and Shadrach, Meshach, and Abednego from the fiery furnace. God’s almighty hand kept David safe from King Saul who sought his life. What more can be said? For time would fail to tell of all the times God’s hand has delivered His people. Jesus says in John 13(:3) that all things are given into His hands by God the Father. That means all things are under His power and control. It might not have looked like it. It might not have looked like things were under Jesus’ control when He stood in the house of the high priest and He was blindfolded and struck by the hands of soldiers who mocked Him (Luke 22:63-65). Jesus never used His hands to strike out in violence at anyone. He only served and healed with His hands. He only cared and showed love with His hands. Yet He was struck by the hands of those who mocked Him. It didn’t look like all things had been given into His hands. He didn’t appear to be in control. But Jesus was in control. He says Himself that He could have called more than twelve legions of angels to His aid, but how then would Scripture be fulfilled (Matt. 26:53-54)? He was in control because it was His will to die. Jesus said that no one takes His life from Him, but that He lays it down of His own accord (John 10:18). All things are given into Jesus’ hands even as He is struck by the hands of others. All things are given into His hands, even as His hands are stretched out and nailed to the cross. All things are given into Jesus’ hands, and He chose to die for us. Out of love for us, His fallen creation, He chose to die. The price of our sins had to be paid, so Jesus chose to pay it in our place, thus rescuing us from eternal slavery in hell. The debt of our sins had to be paid, so Jesus paid it in our stead. And now He calls out to us to repent of our sins. He spreads out His hands all the day to a rebellious people, who walk in a way that is not good, following their own devices; a people who provoke Him continuously (Is. 65:2-3). He is still patient with us. He still waits for us to turn away from sin. He takes us by the hand to lead us out of the slavery of sin. What a loving depiction – leading His people out of slavery by the hand. Gentle yet firm. Holding to prevent falling or a desire to go back into the slavery of sin. Pulling along so that escape from slavery is possible; pulling forward stronger than sin pulls back in order to redeem His people. He holds out His crucified hands to us, calling us to come to Him. All day long He holds out His hands with forgiveness. All day long He holds out His hands with His gifts of forgiveness, life, and salvation. All day long He holds us by the hand, pulling us to Himself. Amen. After air and water, food is the next greatest need for man to live on this earth. After forty days of fasting Jesus was hungry, so the devil tempted Him with food. The devil had also tempted Eve with food in the Garden of Eden. The devil tempted Eve to eat the forbidden fruit. Eve fell into temptation even though she was sinless and perfect and she had a garden full of fruit to eat and was by no means hungry. Adam, who was with Eve, also fell into sin and ate the forbidden fruit. Jesus, hungry though He was from forty days of fasting, did not fall into temptation. The devil tempted Him by saying, “If you are the Son of God, command this stone to become bread.” Well, why not? God provides food for people all around the world. God miraculously provided bread in the wilderness to the sons of Israel, why not now to His only begotten Son? Why should Jesus not prove to the devil that He really is the Son of God and turn the stone into bread? Why would it be a sin to turn the stone into bread for Himself if He is the Son of God? This really was a temptation for Jesus to skip over suffering and dying, and jump immediately into glory. Why go through suffering and death for the people of these kingdoms of the world, why not just take the kingdoms now? Skip the anguish of the soul to the point of death. Skip the beads of sweat dropping to the ground like drops of blood. Skip the torture, mockery, and death. Just take the kingdom now. Once again, Jesus responds with Scripture, “It is written, ‘You shall worship the Lord your God, and him only shall you serve.’” Jesus was obedient to the will of the Father. He was obedient to the point of death. Jesus didn’t come to take on our flesh for His own sake, but for our sake. He came to save us by dying for us. He would not yield to the devil and skip our salvation. This time Satan even quotes Scripture. Prove that you trust God and believe His Word. He’s promised angels to serve God’s children and intervene for you. Why not show it if you believe it? Prove that the Word of God is true. We see throughout the temptation of Jesus that He doesn’t really look like the Son of God. The devil was permitted power to take Him around and tempt Him. The devil takes Jesus and shows Him the kingdoms of the world. The devil takes Jesus and sets Him on the pinnacle of the Temple. Jesus doesn’t face the temptations of the devil as God, but as a man. Thus He doesn’t look like the Son of God and He is tempted to prove that He is the Son of God. But Jesus doesn’t use miracles or divine power to conquer temptation. He simply uses the Word of God. Jesus fought the devil with nothing more than what we have when the devil tempts us, but Jesus never fell into temptation. And Jesus’ temptations were real temptations. Hebrews 4(:15) tells us that Jesus was tempted in every way as we are, yet without sin. Jesus remained wholly faithful to the Father and obeyed Him in thought, word, and deed even through the fiercest temptation. So is Jesus an example for us then, in how to face temptation? In a sense, yes. Whenever we are tempted by sin we should go to Scripture, to what God says. Whenever we are tempted by sin we should go to Scripture, our source of strength. And in a sense, no. When we are tempted, we are unable to avoid sin. Temptation itself arouses in us desires for those things that God has not given to us. We sin, just being tempted, before we’ve said or done anything. Desires are kindled within us to eat, to drink, to take, to say, and to do those things that God has not given us. That’s the real temptation overriding all temptation. The devil wants us to place ourselves into the role of judge. I will judge for myself what is right and wrong. I will judge for myself how much I should have and take for myself whatever I want so I have that amount. I will judge for myself what gives me pleasure and I will do that. I will judge for myself what is most important for me and I will pursue that no matter what. The answer to all these temptations is God’s Word. God tells us in His Word what is right and wrong. It doesn’t matter what we feel or what we want. It doesn’t matter what other people do or don’t do. Scripture is our answer to temptation. But even with Scripture, we still can’t face temptation following Jesus’ example. We still fall into sin when tempted because the very desires of our flesh are sinful. We can only be saved by Jesus. His temptation was for us. He fulfilled what we cannot fulfil. He never even for a second desired anything against the will of God the Father. 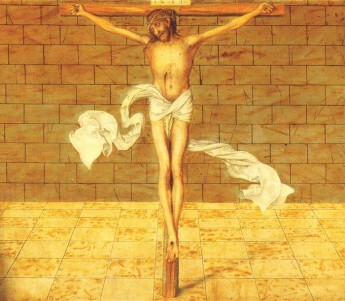 He was obedient through all temptation; obedient even to the point of death on the cross. He never desired anything that was not according to God the Father’s will. He didn’t desire to eat even when starving because it was not the Father’s will. He didn’t desire to skip suffering and death because it was the Father’s will to save us. He didn’t desire to test God because He fully trusted in Him without testing Him. We cannot conquer the temptations of the devil as Jesus conquered them. We can only conquer temptation in Jesus. Jesus has conquered temptation for us. If we could conquer temptation, we would not need a Saviour. Then we wouldn’t need someone to fulfil the Law in our place. We wouldn’t need someone to die for every time we have fallen into temptation. Jesus did what we are unable to do. Jesus fulfilled everything demanded of us and died in our place, taking the punishment of all our falls into temptation. Now we have Jesus to set over against the devil. When temptation comes, which it will, it is already conquered by Jesus. We don’t have to overcome the devil – Jesus has already done that. We don’t have to suffer for our sins – Jesus has already done that. We don’t have to die for our sins – Jesus has already done that. Adam and Eve fell into sin by eating what was forbidden. Jesus did not fall into sin when tempted to eat what was not given Him to eat by the Father. Now Jesus gives us His perfect, sinless body and blood to eat and drink to forgive us our sins of doing what has been forbidden. He gives us His body and blood to strengthen us in temptation. He gives us His body and blood to bring us to eternal life where there is no more temptation. He gives us food which we need more than air and water. This holy food meets our greatest need. It gives us the forgiveness of sins and gives us eternal life. Amen. Dear sinners who have become the righteousness of God: Grace, mercy, and peace to you from God the Father and our Lord and Saviour Jesus Christ. Amen. How easy it is for us to confess the sins of others. We think we’ve hidden our own sins so well from men that we think they are hidden from God also. Oh how good we are at fooling others around us into thinking we are pious, upstanding Christians. Look at us, we go to church all the time but those other people they barely ever go. Look at us, we give generous offerings to the church all the time but those others, they dig into their pockets and throw in some change. Look at us, our family is still together but that family over there, divorced with a child that ran away from home. Just look at the world, how awful it is and how full of awful people it is! Thank you God that I am not like other men, extortioners, unjust, adulterers, or even like this tax collector. Thank you God that I am so good. Thank you that I love my wife so unselfishly and raise my children to be perfect little angels. Thank you that I’m so strong and disciplined that I can give up something very important to me for Lent. How delusional we can be. Viewing things this way is like being a patient with a terminal illness, and looking at other patients in the same hospital ward with the same illness and thinking you are different from them just because they are showing more symptoms of the same disease. The same disease of sin is in us as is in all the world. If we didn’t have the disease of sin, we would never get sick. We would never hurt or be sad. We would never die. Look, it’s not like the Pharisee in the Temple was lying. He was actually telling the truth. He never extorted money from anyone. He never unjustly accused anyone, including the tax collector. He never physically committed adultery. On the other hand, he did fast twice a week. He did give ten percent of all his income to God. He did the good and avoided the bad. The symptoms of his sinful flesh were not so obvious to those around him. The tax collector, on the other hand, had sinned so obviously that the entire nation knew it. Tax collectors worked for the Roman government to collect tax from the people of Israel. They added as much as they could to the tax bills of their own countrymen and put it in their own pockets. The Romans didn’t care as long as they got their share. The people of Israel could complain, but there was nothing they could do. The tax collectors had Rome on their side and could thus easily steal from others. Other types of sinners the Pharisee mentioned can be equally as obvious. Extortioners steal from others with violence and threats of violence. You can recognize such people by what they do. Adulterers may be living together outside of marriage which makes the sin readily apparent to the world. The unjust do not follow the law but are crooked, dishonest, and untrustworthy which can be seen by everyone around them. But we all have the same disease of sin. According to God’s Law, it’s not enough that you don’t steal; you cannot even want what someone else has. It’s not enough that you don’t commit adultery; you cannot even have lustful or impure thoughts. It’s not enough that you don’t murder; you cannot even have anger or hatred toward someone, even if that someone hates you. The Law demands to be kept perfectly – not just outwardly, but also inwardly in the heart. Any slip or failure is deserving of punishment. This prayer is asking God not to give us what we deserve. It is praying that God will not give us the temporal and eternal punishment that we deserve for our sins. Be merciful to me, the sinner. Not just a sinner, but the sinner. The sins of others don’t matter in your relationship with God. So also the Apostle Paul calls himself the foremost or chief sinner as if there is no other sinner in the whole world (I Tim. 1:15). So we pray for mercy. Be merciful to me, the sinner. But based on what can we ask this? What can satisfy the wrath of God over our sin? It is not anything that we have done. That’s what the Pharisee tried to do with his list of good works. That’s what Muslims are trying to do with their pilgrimages, prayers, and jihads. That’s what atheists are trying to do with their environmentalism, vegan eating, and saving of endangered animals. That’s what the Roman Catholics are trying to do with their Hail Mary’s, pilgrimages, and sacrifices of the Mass. But none of this can satisfy the wrath of God over sin. None of this turns away God’s anger from us. There is only one thing that has ever and will ever satisfy the wrath of God over sin. There in only one thing that has ever and will ever turn away God’s anger from us sinners – the sacrifice of God’s own Son on the cross. Jesus’ death is the sacrifice that has removed the wrath of God from us. Jesus is the Lamb of God who takes away the sin of the world (John 1:29). This is because Jesus became the sinner for us. For our sake God made Jesus to be sin even though He had committed no sin, so that in Him we might become the righteousness of God (I Cor. 5:21). Jesus became the sinner; the only one in the world. He took every single sin on Himself. He took on Himself the sins that are readily apparent to others including extortion, injustice, adultery, and theft. He also took on Himself the sins that others cannot see as readily including anger, discontentment, lust, and coveting. Jesus suffered and died for every single sin ever committed. He took on Himself every punishment with which hell can threaten us. Jesus came as the Great Physician to heal all of us, regardless of how bad the symptoms have been. He gives us all the same medicine of His holy body and blood which give us the forgiveness He won for us by becoming the sinner in our place. Jesus’ body and blood are the antidote to the disease of sin pulsing through our veins. Forget the sins of others whether they are readily apparent or well hidden. Receive the forgiveness of sins in Jesus’ body and blood that is for you to forgive you all of your sins. Because God has also promised to forget your sins and remove them from you as far as the east is from the west (Ps. 103:12). He has promised to tread your iniquities underfoot and cast all your sins into the depths of the sea (Mic. 7:19). God does this because Jesus’ death has satisfied His wrath over sin. Jesus’ death has turned away God’s anger from us. So don’t hold onto your sins and try to hide them from God. Confess your sins and receive the free forgiveness of sins for the sake of Jesus who became the sinner for you, so that you might become the righteousness of God. Amen. Dear people for whom Jesus died: Grace, mercy, and peace to you from God the Father and our Lord and Saviour Jesus Christ. Amen. It’s the last Sunday before Lent. The paraments are white for the Transfiguration of our Lord and we heard about Jesus appearing with Moses and Elijah in His glory to Peter, James, and John. Unlike the infant in the manger, here Jesus appeared dazzling and glorious. Unlike the youth in the Temple who amazed the teachers of the Law with His wisdom while still just looking like a boy, here Jesus appeared in His splendour. The Transfiguration was an awesome and glorious event. But there’s something ominous and gloomy in the Transfiguration. Leading up to it, Jesus had just told His disciples that He would have to suffer many things at the hands of the elders, chief priests, and scribes. He told them that He would be killed and on the third day rise again. He told them that if they want to come after Him, they have to pick up their cross daily and follow Him. Then He talked with Moses and Elijah about His upcoming departure – His exodus – His upcoming suffering and death which was about to be accomplished at Jerusalem. Yes, even while shining in glory, Jesus is talking about His death, and the Transfiguration, in addition to being awesome and glorious, is also ominous and gloomy. Death looms over the Transfiguration. So also today is ominous, as we celebrate the Transfiguration of our Lord. We know what’s coming this Wednesday. The white of transfiguration will be replaced with the somber purple of Lent. The cheerful Alleluias will be replaced with penitential hymns. In some traditions ash crosses are put on foreheads with the words, “Remember you are dust, and to dust you shall return.” We head into forty days of humility and repentance, sombreness and sorrow. But penitential stuff isn’t really our thing. We prefer the joy of Christmas, the joy of the Epiphany, the joy of the Transfiguration. We’re content with the joy and wouldn’t mind skipping over the dark, gloomy stuff. So also Peter was quite content on the mountain. He didn’t know what to say, but he knew he wanted to remain there instead of returning back to regular life. He didn’t want to go back to carrying his cross; back to the demanding crowds; back to his failures as a disciple of Jesus. In fact, the first thing that happens when they come down from the mountain is a crowd meeting them and wondering why Jesus’ disciples failed to cast out an evil spirit from a little boy. No, forget that stuff. Let’s stay on the mountain away from it all. Let’s build three tents here, one for Jesus, one for Moses, and one for Elijah. Forget the cross. Forget death. We can relate. We don’t want a cross either. We don’t want to pick up our cross daily and follow Jesus. But God wants to teach us. After all, on the Mount of Transfiguration, God the Father said concerning Jesus, “Listen to Him.” Listen to Him tell you about His death and resurrection. Listen to Him tell you that His death is for you. But our sinful flesh doesn’t want to hear Him, so God gives us crosses to bear. Crosses that make us stop relying on ourselves and turn in repentance to Jesus, to listen to Him. God gives us crosses that make us listen to Him teach us those things that we would not listen to when everything is going our way, when our crosses aren’t so heavy. He teaches us that when we are weak, He is strong. It is always He who gets us through everything in our lives, but when things are going well we tend to think that it is because of us and what we have done. The hardships of our crosses remind us that we are always weak and that God is always our strength. And remember that without the cross of Jesus, there is no joy of Easter. Without death, there is no life. Without Jesus dying to defeat death, we would be doomed to eternal death. That’s why Jesus is talking about His death when He is shining in glory. Because when He’s talking about His death, He is talking about your life. And this life that He gives to you isn’t just floating around somewhere out there for you to find. It is not to be found in nature, in feelings, in experiences, or in feel-good novels or movies. Life is not to be found in ourselves, our plans to turn away from sin, or our desires to do better. Jesus gives life to you specifically and undeniably in the waters of Holy Baptism. He gives it to specifically and undeniably in Holy Absolution. And He gives it to you specifically and undeniably in His Holy Supper. Jesus gives you life in these sure and certain ways so that you know where life is to be found. And Jesus doesn’t leave you on your own to bear your cross. Your cross is His cross as surely as His death is your life. He strengthens you in your weakness when you rely on Him instead of yourself. Listen to Jesus. If He sends you a cross to bear, listen to Him. Bearing our crosses teaches us our real need. It teaches us that we are dust and to dust we will return and that there is no power that can deliver us from death but the power of the crucifixion of the Son of God where he faced our death and destroyed it. Because of Jesus’ death, our death is the gateway to heaven. Because of Jesus’ death, our death is the portal to eternal joy. We need the Lenten time of humility and repentance, sombreness and sorrow. We need to hear the dark, gloomy retelling of the exodus of our Saviour – His suffering and death on our behalf. This is what Moses and Elijah spoke about with Jesus on the Mount of Transfiguration, and it is what they preach in their writings in the Old Testament. We need the time of Lent since none of us is able to escape the ashes of this life. None of us is able to escape death and suffering. None of us is able to escape sin. The time of Lent is a time of listening to Jesus. We add midweek services to provide additional opportunities to listen to Jesus. It is a time of hearing that we were made from dust and to dust we shall return – but also of hearing that we will be raised from the dust to eternal life. It is a time of hearing of the suffering and death of Jesus – but also a time of being in great anticipation of His resurrection. We see joy and sorrow are not always mutually exclusive. We can have both. We can have joy in sorrow. We can have sorrow in the crosses we need to bear and yet have joy that Jesus has saved us eternally from all of them. We can mourn our sin yet rejoice in the forgiveness of sins in Jesus. We can mourn over the death of Jesus while rejoicing in the life He has given to us. Because His death is our life, and we will receive the glory of His transfiguration because of His death which was accomplished at Jerusalem. Amen.